Atlas Wire is a premier manufacturer of Building Wire and Fixture Wire. Atlas Wire specializes in fast deliveries and lower minimum order quantities to provide clients with what they need quickly, at a reasonable price and in quantities they need. 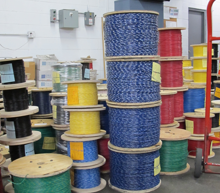 Our wire meets or exceeds the standards of the National Electric Code. We produce RoHS Compliant TFN (ZIPR) to UL 66 Standard for Fixture Wires ,RoHS Compliant TFFN Wire, and RoHS Compliant THHN(ZLGR) Wire to UL 83 Standard for Thermoplastic Insulated Wires. Atlas Wire provides high-quality Building Wire for residential, commercial and industrial buildings. Our Building Wire can also be found in Mobile Homes, Recreational Vehicles, Boats and Substations. Our THHNBuilding Wire is made to the exacting specifications outlined in UL Standard 83 Thermoplastic-Insulated Wires and Cables. Atlas Wire manufacturesTFN and TFFN wires to meet UL Standard 66 for Fixture Wires. Fixture Wire from Atlas Wire is used in a number of ways – in conduit and other raceways and in control circuits. Fixture Wire from Atlas Wire can be found in a wide variety of appliances, as well as a number of different lighting fixtures. Atlas Wire is a leading supplier of Fixture Wire, PVC Insulated Building Wire and PVC/Nylon Insulated Building Wire. The Conductors for our Building Wire and Fixture Wire are Solid, Bare Stranded, Solid Tinned, and Tinned Stranded. When you need high-quality Building/Fixture Wire quickly in quantities that are right for you, you should contact us atlas Wire. Call our Illinois Office at (847) 678-1210 or our Arizona Office at (520) 747-4500 or Send Us a Message to discover how we can serve your needs for Building Wire and Fixture Wire. Click on a product subcategory below to view our fixture wire selection.